May improve joint pain and symptoms of arthritis. Works best when taken with Chondroitin Sulphate (synergistic action). N-Acetyl Glucosamine is a muco-polysaccharide precursor of hyaluronic acid, an essential component of the synovial liquid which lubricates the joints. Many studies have shown that NAG helps the organism repair damaged cartilage, reduces inflammation and pain, and helps to restore mobility in the joints. 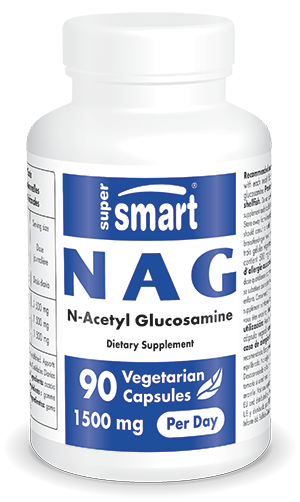 NAG is much better absorbed by the oganism than simple glucosamine sulfate. NAG is used preferably together with Chrondroitin Sulphate. b) Favour hyaluronic acid synthesis (the substance which gives the synovial liquid its viscosity and enables lubrication between the synovial membrane and cartilage). c) Inhibit the enzymes responsible for macro-molecular damage of the cartilage cells. d) Reinforce the mobility of clots, fibrins, lipids and cholesterol deposits in the articular inter-spaces and the blood vessels of the joints. Alone, no product or nutritional supplement can do all this....Clinical studies have shown that Glucosamine enables to attain objectives a), b), e) and f), whereas Chondroitin Sulphate enables to attain objectives a), c), d), e) and f). It is, therefore, because their effects overlap, that their association is so effective against arthrosis."